Leeds-based Jet2.com has grown to become Britain’s number four airline, carrying seven million passengers a year. UK airline Jet2 has been named Britain’s best low-cost airline and the seventh best in the world, according to TripAdvisor Travellers Choice Awards. British Airways, EasyJet, and Ryanair failed to make the grade in the travel planning and booking site’s awards. Virgin Atlantic was named Europe’s top major carrier. Award winners were determined using an algorithm that took into account the quantity and quality of airline reviews and ratings submitted by travellers worldwide over a 12-month period on TripAdvisor Flights. 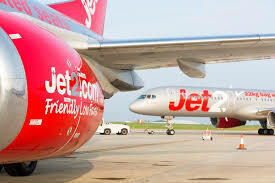 “We have been beating the competition to win prestigious awards in the UK for some time, and now we are taking that success on to a global stage,” said Steve Heapy, chief executive of Jet2.com and Jet2holidays. The Leeds-based airline has grown to become Britain’s number four airline, carrying seven million passengers a year. The biggest winner in the awards this year is Singapore Airlines, claiming the title of top airline in the world. In addition, the airline boasts awards for Best First Class and Best Economy Class in the world. Among the top ten best-rated airlines in the world Air New Zealand and Emirates come in at second and third place respectively. Asia holds the highest number of individual winners in the world top ten with four winning carriers – Singapore Airlines, Japan Airlines, EVA air and Korean Air.